How safe are x-rays? Why do you leave the room when taking x-rays on me? X-rays are important because they help dentists to visualize the dental issues that are not visible with oral check-ups. A dentist Richmond Hill will recommend it when they feel that there is a hidden issue that needs to be uncovered to ensure that the treatment given is effective. However, many people will be reluctant to take x-rays to avoid radiation exposure. 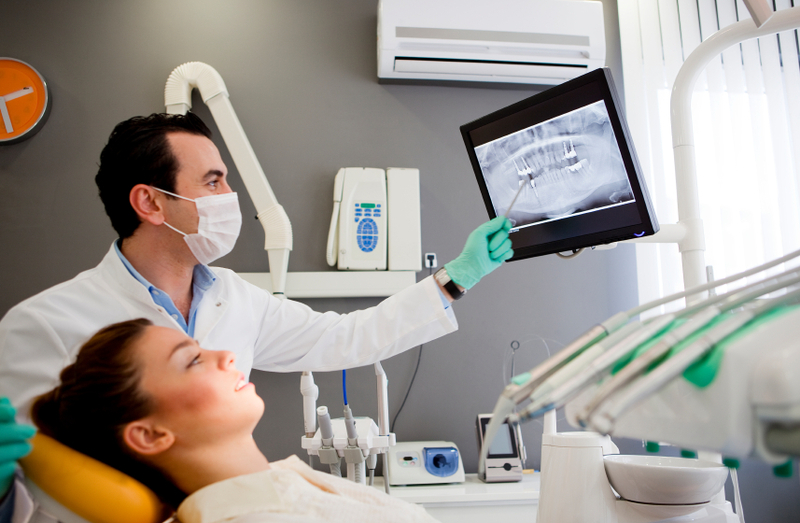 The amount of radiation received during dental x-rays is relatively small. And dentists will use modern techniques and equipment to keep the risks minimal. If you are pregnant, you should notify your dentist so that they take the necessary precaution. X-rays are not recommended during pregnancy unless it is very necessary. In addition, if you’ve had screening tests or cancer treatment it is important to talk to your dentist about it. They will take the necessary steps to minimize the amount of radiation. A leaded apron will be placed over the abdomen to reduce exposure to other body parts. A leaded thyroid collar is also used for women of childbearing age, children and pregnant women to protect the thyroid from radiation. Studies show that the amount of radiation you receive from a single session of dental x-ray is less than the exposure you get from air, water, soil, sun and the bricks of your house. Therefore, the risk of exposure is minimal but dentists will prescribe it only when necessary. It will only be done when the benefit of the x-ray is significant. Dentists will leave the room during x-ray so as to limit the amount of radiation they receive. This is because they attend to hundreds of patients every week; and if they remain in the room with every patient, the level of radiation they are exposed to may be too high and it is cumulative which is risky for their health. The staff will wear a small badge that is used to check how much radiation they are exposed to. However, for a patient the risk is low since you get exposure for just one session. Are You Suffering From Persistent Jaw Pain? At what age should I start bringing my child to the dentist? Can Teenagers Have Dental Implants? Dental Implants – What Are Your Options? Dental Implants vs. Bridgework: Which is the Better Choice? Is It Possible to Rebuild Bone Using Latest Technology? Is There a Cure for Chronic Bad Breath? My dentist is recommending treatment (I know nothing about). What should I do? What a general dentist can do for you? What’s Next After Losing Your Tooth? What’s the difference with whitening products in stores vs in office whitening offered by Dentists? Why is it important to keep scheduled dental appointments? Will my insurance cover my appointment? We are located in Richmond Hill and serving customers from the Greater Toronto Area: North York, Vaughan and Markham. 5 stars / 37 reviews. © 2016 Hummingbird Dental. ALL RIGHTS RESERVED.